I've recently seen some authors requesting a harsh but truthful critique on their work, and I do believe that I really need a good dosis of bluntness on my work since I think that's the better way to improved things. Sorry if I'm being too spamy or tiring for posting this. For this reason and cause I don't like to receive without giving anything in return I offer to do the same and review your comic in the best way I can. I have to point out that I'm not a writer, so don't expect much criticism in the way the plot, characters and world are written. Either way, here's my comic if you want to give it a chance. Thanks again for your help! Don't be afraid to drop your comic below! So I just glanced through your comic, mostly focusing on the art. First of all, from your first episode to your most recent one, you have improved greatly. Your linework has gotten much cleaner, and you are more consistent in character design. For your coloring, it is a bit messy, and your shadows do seem to be placed in the wrong spots for the panels light source at times. I would suggest maybe looking into cell shaded things, just for examples of cleaner shading. Your characters have cool designs, but I think it would be useful to you to spend a bit of time practicing anatomy. Maybe just doodling circle and line figures, but focus on proportioning and perspective. While sometimes you can really tell what your characters are feeling, other times the expressions are confusing or a bit underwhelming. I would like to note that your comic is awesome, and you have dedication that I admire to have so many episodes up. You have definitely improved, and are an amazing artist. These are just small things, really, that I thought were worth noting. Otherwise, keep drawing, you are awesome. Here is my comic, if you want to critique me as well. Be harsh if need be; I can take it! Then I guess I'll be talking about the pacing and text. I know that you use the traditional comic format, but I wish there was more spacing between the panels. Let's take chapter 3 page 22 for example. Immediately below the first two panels are the knocking SFX. Due to the lack of space, the SFX are bleeding to the previous panels, and I find that very muddy. However, if you drag that panel a little lower, you would have more space to fit them into. Another thing would be the stray dialogues (the ones that aren't in speech balloons). I find it very difficult to read them, even on my laptop, since their size is so much smaller than those in speech balloons. My recommendation is to make it around half the size of the normal dialogue. Drawing style doesn't bother me at all, and I like the characters and their designs. So I'm sorry I can't criticise anything about it. The only things which bothers me is that I don't see enough originality in your setting. It looks like Yet Another Fantasy setting so far. I would like to see more original, unusual elements in it. But maybe I just hurry too much with it, and more world aspects will be revealed in the future? Slow updates and slow pace of the story in conjunction lead to noticeable lack of dynamics. I think that your story have a potential, and it probably could include much more events and adventures. As I said, I liked the characters and would like to see how will they be revealed in action ( for now, I've seen only one battle with them ). So I hope to see this in the future as well. Since you've already read my comics, I hope you will be able to point out what you don't like in it, too. First I have to say that I really liked all the episodes, theme wise. They were so funny and relatable I couldn't help but smile on each of them. Also I always love a nice slice of life comic. I've noticed that your lineart looks a bit choppy sometimes, the edges look kinda harsh and squary in some scenes. Maybe you could check some other brushes or play around with pressure settings to make it smoother. I know you're aiming for a cute and simple chibified style, which is great, but they may look too much like beans for my personal taste. I don't know but have you tried drawing them in a more proportioned way? I believe if you used a more "realistic" style It could give you more room to play with body gesture and expressions. Again don't mind me if it's an stylistic choice. Backgrounds could use some new look, just some shading or a simple gradient would make them pop up more. The last thing I want to talk about is coloring. I've noticed that you usually shade with more saturated colors and add light with lighter ones, but they are all from the same hue which make your drawings a bit dull. I'd suggest to play around with other colors like bluish, purplish tones for shading and yellowish ones for highlights. Also layer modes such as multiply and overlay are your friends (as long as you don't overuse them). Either way I really liked your comic and I'm eager to see more of it. I'm not going to focus to much on technical aspects of what I saw, things like anatomy and so on, in favor of discussing what I feel is a fundamental divide between what you do artistically... and what you WANT to do artistically. The things that influence us often don't play to our natural strengths as artists... so we battle against things we have greater potential at to reach technique/goals that aren't in line with what we already do. You're already a competent artist/storyteller, that's clear. What's at war is your character designs/drawings lean towards a simpler minimalist approach while your coloring is trying to push those images towards the styles you chose to be influenced by. I see a lot of animator qualities in your line work and wonder if a simpler cell shading style would better serve your art, at this time. Then really lean more into those natural instincts as you move forward. Thank you! I'll definitely keep everything in mind! I think you are doing quite well. You ought to get it onto Comic-Rocket. Your style looks quite polished and it shows that you have a clear idea of what you want to do with it. The anatomy is pretty correct overall, though sometimes the limbs look too thin. The only big issue I have is the eyes, they are way too big for my taste, but specially is the way you draw them over the bangs of the hair. I know it's usual to find it on mangas, but I find it rather unprofessional and annoying. I'd go for drawing the hair over it or just changing the hairstyle. I'm in love with the whole mood you created by using mostly bluish hues on the whole shot, it really gives it a cohesive look as a whole. Also it makes the clock, a pretty important element, stand out with it golden tones. All the gifs you used certanly are nice details. I have seem them sometimes in other comics, but they never cease to amaze me and they work pretty well on yours. And I think that's all. Great job! Thanks for the review! I hope that I can work harder on what you pointed out, I'm pretty worried about your second point too. I'll try to make things more dynamic somehow. About your comic, I've been following it for quite a long time, so know that there aren't many big things I don't like. First of all, your lineart seems far too thick. I believe that using a smaller brush would make everything look better and pop up more. Same for backgrounds, they need to blend more to make your characters shine. Since the color scheme is pretty similar, the best way to solve this is using a line width far thiner than the one you use for characters. I believe I've already told you this, but I'm not really fond of the copy paste of panels. To be honest, it's not a really big issue cause people are not likely to remember the exact looks of previous panels, so it's more like a personal issue. 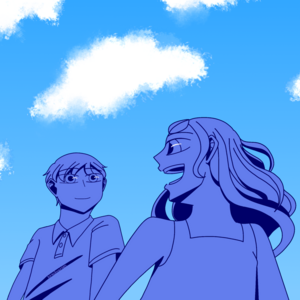 About the coloring, your shades are kinda dull sometimes, but it suits the mood of the story, so that's okay. The thing that I've been thinking about, have you ever thought of actually blending the shadows? It may look nicer that way. Finally, about the plot itself. I find it very original and realistic, it shows the darker aspects of the sci-fi genre that people are afraid to show. Also it's clear that you have a pretty strong worldbuilding going on, so I have nothing to critique about that! I'll try to draw backgrounds with more thin brush and look at the results. Nah, I'm pretty agree that I should copy-paste less. I will try to make it more and more rarely in the future chapters. I'm not sure, what do you mean by "blending the shadows"? Seeing as a lot of people have already critiqued the art and well, you've seen my art and pay construction, I'm in no place to talk! Much in the same way Shade is in no place to talk when it comes to giving people advice on codenames! So, I'm instead gonna focus on something else: The writing. You've probably heard it before from mrs and I'm probably gonna say it again: The story and characters have potential, but they're really cliché at the moment and it feels a lot like "My first fantasy manga." Now, please don't take that the wrong way: You're still doing a solid job on your comic and you have me hooked. (If only for that little meta-rivalry the characters of DRGN and your guys have with each other.) But the big problem is that we haven't really seen that much in terms pif really anything. That might just be the problem of webcomics in general (Where instead of getting sowing like 20-ish pages a month like normal comics, we get 1-2 pages a week.) We're about 3-ish chapters in and what all has happened? We meet our main character and find out she has no memories, we meet the secondary character, the two have a girly slap fight in the woods, go their separate ways, then meet up with each other again. All in all, it feels more like the start of a quirky fantasy based romantic comedy than the start of a Tolkien-esque fantasy epic or whatever you took your main inspiration from. (Though a fantasy romcom is something I would definitely read, especially with Flare and Shade.) Speaking of those two, let's talk about them, shall we? Apart from a few incidental characters like Flare's kid friend and "dad". We kind of only have two and a half characters to speak of: Other Flare, Professional Chicken McNugget, and The Voice inside your head that tells you to throw rocks at people. This has both pros and cons. On the pro side, you can focus more on both individual characters better (this is a problem I've been running into with DRGN in trying to focus on a team of six plus supporting cast plus villains) On the con side, it kinda makes things feel a bit claustrophobia and empty with just those two and a half guys plus incidental characters. Personality wise, the two are decently likable, play of of each other well, and have decent potential for growth. But right now, both are really, really, REALLY stock archetypes found in manga and again, romantic comedies. The straight laced and stoic guy, the perky, friendly girl with memory loss, and the snarky old guy. It's literally just Finding Nemo or Zootopia with Chicken Nuggets! (Just kidding on that front, but you still get the joke and dynamic between the two.) Special mention goes to Shade, he's kinda bland al things considered. Sure, her's got a lot of mystery surrounding him, but he really hasn't that much going on with him other than that and and his job as a professional Edgelord. (Also, who names themselves Shade when they run around with light blue hair and bird wings? I mean, really? Shade's the kind of guy who would unironically buy Jack Skellington merch from Hot Topic if he could, wouldn't he? )Same kinda goes with Flare, I like that her childishness is implied to come from the fact that she was more or less literally born yesterday and I hope that's explored more later down the line. But other than that, sit down and throw one of those little bean shaped plushes of an anime character at an anime streaming site or manga shelf and you're bound to find at least five or so female main characters just like that if slightly more developed due to being farther along in their stories due to being released in big chunks instead of drip fed to us two pages at a time. I'm sorry if that sounded rude and harsh, I don't mean to I was just giving my honest thoughts and I do genuinely hope you succeed in this. The fact that you actually sat down and started work on your passion project despite knowing that it's nowhere near perfect is admirable. (and much better than me in that regard.) So best of luck, and I hope this helps. As for my comics, I would say DRGN for critique, but that doesn't exist yet. 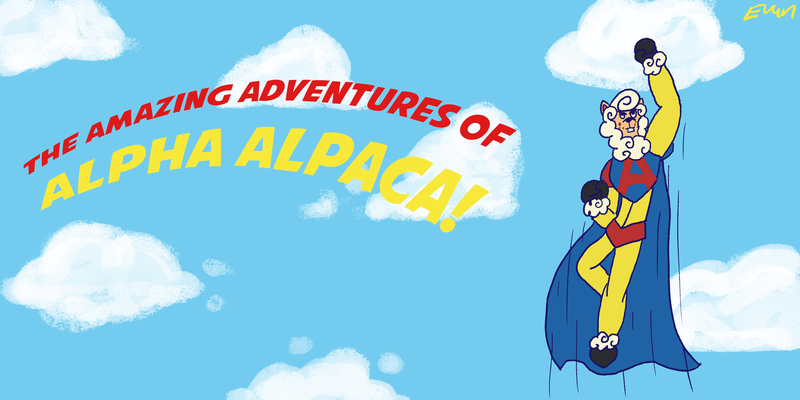 So I'll go with my next best option: Alpha Alpaca! Especially seeing as I made it specially to practice serialized comic booking for DRGN and the like. I'd love to hear how it can be Improved for future projects! All in all, best of luck and keep up the good work! I'm eager to see more from you! @tired_programmer Blending Shadows is the name of the upcoming sequel to Burning Shadows!